At Ndutu refugee camp in Tanzania, Abdul Yamuremye in his tent with his wife Hadija Umugure and their family fled violence in Burundi after their house had been attacked killing Abdul's two brothers, a friend who stayed with them and her three children. Denouncing reports of open intimidation from armed militia against citizens of Burundi, the United Nations Committee on the Elimination of Racial Discrimination (CERD) has called upon the Government to take immediate effective action to protect its people. The 18-member expert Committee, which monitors worldwide implementation of the International Convention after which it is named, is also deeply concerned about a Civil Service questionnaire issued 8 November asking public servants to state their ethnicity. The experts are requesting that Burundi allow a UN police component approved in July by the UN Security Council to monitor the security and human rights situation in the country as soon as possible. 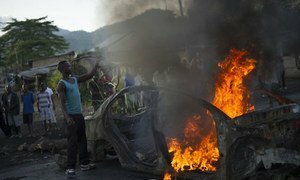 “Such a survey, given Burundi’s history of virulent ethnic conflict, could spread fear and further mistrust among the population, and could be hugely dangerous if misused,” said CERD Chairperson Anastasia Crickley in a news release. Moreover, there have been recent reports of killings, summary executions, disappearances, torture, frequent use of hate speech by Government officials, and a growing number of people fleeing the country. CERD decried the country’s increasing lack of cooperation with the international community and called upon the Government to reengage with the UN Human Rights Office. The Committee also urged Burundi to adhere to its human rights obligations, including those that arise under the International Convention on the Elimination of Racial Discrimination. The Committee’s early warning procedure was established in order to respond to various conflicts in the early 1990s and to prevent similar crises from arising and escalating into conflict and violence. Following a decision of the United Nations Human Rights Council, in which it setup a commission of inquiry to investigate human rights violations and abuses in Burundi, including whether they may constitute international crimes, the President of the body has appointed the Commission’s Chair and members.